Violet Sato was the first of five children. Her parents ran the general store in Hale'iwa. They believed education was the pathway to a better life for their children. Consequently, Sato's siblings all completed college. "My silent wish is that students will all become better human beings because of the help they have received. I sincerely hope that they will respond by helping someone else. In addition perhaps even members of their families will catch the spirit and spread it further. That is my hope and my inspiration. Scholarships have the potential to transform lives." 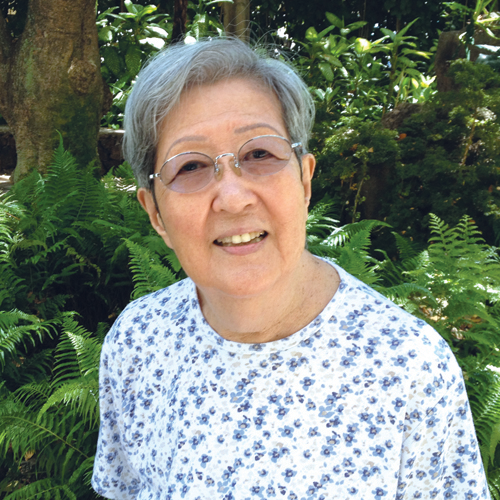 When war erupted in 1941, Sato volunteered at Waialua High School. Eventually her 'job' at Waialua High expanded to include duties as secretary, accountant, nurse and librarian. She also helped the cafeteria manager acquire the school food supplies that were difficult to find during the war years. The school principal suggested Sato take evening classes at UH to complete her degree. That suggestion would turn out to be very useful to her in later years. In 1951 she became registrar at Kaimukī High School. By then she had attended a variety of UH courses related to her career. For example, if she had questions about accounting, she took an accounting class. At Kaimukī High she oversaw the testing program and was a part-time school counselor. She took pains to instill self-confidence in her students. When she recognized a student was having difficulties, she would intervene. When a student came to school without lunch or lunch money, she preserved his pride by giving him an advance in exchange for his coming in after school to help her with classroom chores. Thanks to these successful interventions, some of her 'problem students' completed high school, went on to college, and are now comfortably retired. The reputation she established in education came to the attention of the head of Damon Enterprises and Charities. He offered her a position as his executive assistant, which she held for 19 years. Sato then spent four years in a similar position with C. Brewer's International Agribusiness. The last eight years before retiring from full-time employment, Sato served as executive assistant to the Richard Smart Trust. After she retired, a friend suggested that she continue her service to students by funding a scholarship. With the help of UH Foundation, she established the Violet S. Sato Endowed Scholarship Trust in 2006. The fund supports two graduates each year, one from Waialua High School and one from Kaimukī High School. They can attend any UH campus. "Scholarships have the potential to transform lives," Sato said. She recently increased her scholarship fund with a gift of appreciated securities to the endowment. She will also grow the fund through deferred gifts from charitable remainder trust proceeds, a life insurance policy and a bequest in her living trust. The enhanced fund will continue to grow in perpetuity to help even more students. "My wish is that students will become better human beings because of the help they have received," said Sato. "I sincerely hope they'll respond by helping someone else. Perhaps members of their families will catch the spirit and spread it further."